November 15, 2010, Beijing. One of the organizers of China International Choral Festival, the CAEG (China Arts and Entertainment Group) signed a cooperation agreement with the IFCM (International Federation of Choral Music). In July 2012, two parties will hold a seven-day festival “The 11th International Choral Festival and IFCM World Choral Summit”. This is obviously a powerful combination of the two sides, which makes it possible to launch the preparations for the Summit and Choral Festival two years in advance. The development not only creates a new era of Chinese choral music, but also shows CAEG’s ambition to become a leader of the world’s choral music. IFCM is the official representative of choral music on the International Music Council of UNESCO. The Council recognizes that there are perhaps more people in the world participating in choral music than in any other group activity and that choral musicians need an organization such as IFCM to encourage and facilitate international communication and cooperation. 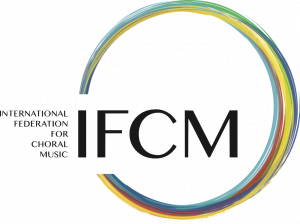 IFCM is the official representative of choral music with the most broadly representative and most authoritative professional background in the world. Administered by the Chinese Ministry of Culture, the CAEG has a strong international cultural exchange experience and is widely acclaimed for its cultural activities operations. The CAEG has been the organizer of China’s only state-level international choral event – “China International Choral Festival “- for twenty years. The 10th China International Choral Festival was successfully held this summer, and received the support and assistance of IFCM. The signing of the agreement marks a formal way to establish a steady cooperation side by side with the “giant”, and to lay an important cornerstone for the future development of the China International Choral Festival. “We are very pleased to sign such a cooperation agreement with IFCM. Collaborating only with giants could be the fastest way to catch up with the trend, and only with the influence of giants can we build our choral brand more with less,” says Mr. Zhang Yu, President of CAEG. 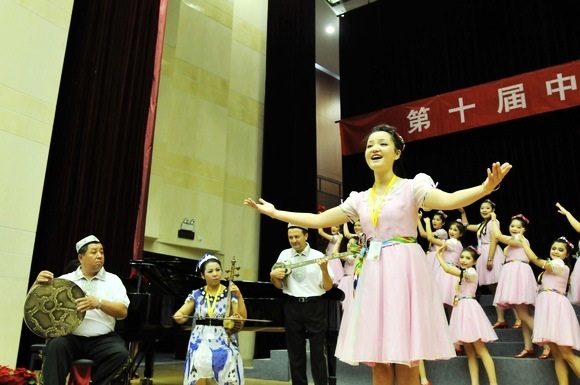 Choral music in China is the most widely enjoyed music form for the public. 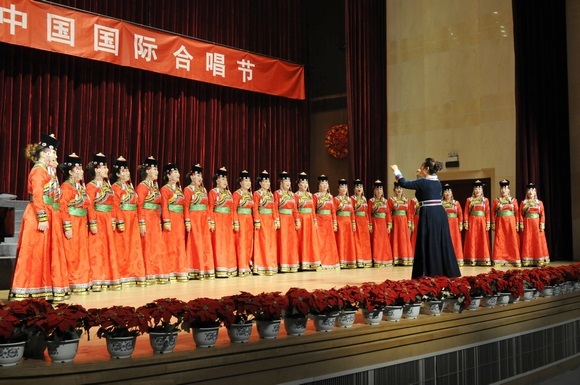 Today, China has tens of thousands of amateur choral organizations. Choral music is also widely appreciated in the world. Representing choral groups from more than eighty countries on five continents, the IFCM is the most professional and authoritative organization in the world. Choral conductors and professionals in Beijing are convinced that IFCM is significant for the China International Choral Festival: the fact that IFCM is the most representative organization underlines the fact that choral music has a rich connotation in the five continents; the development and integration which cultural diversity brings to choral music are the main themes of our time. Chinese choral music needs an effective platform on which to catch up with trends in international development, and to absorb the advanced experience of foreign countries. They also believe that China is also significant for IFCM: cultural diversity is the main theme of the twenty-first century; China International Choral Festival should also be able to make China’s own voice heard. The traditional territory of the choral world, based on European culture, has been changed by multiculturalism, and cultural diversity in the international choral community has given rich fruits. China has five thousand years of culture. China is calling for a national platform and a world-class “booster” to combine its own national culture with choral music and to contribute to the development of choral music. Joined by IFCM, China International Choral Festival is the best platform. With the further extension of reform and opening up to the world, China has now entered the best period in the history of its development. Culture is unprecedentedly highly regarded by the State. China International Choral Festival is a national arts festival, and that is the reason why the Ministry of Culture and the state-owned CAEG vigorously promote the China International Choral Festival at international level, and present the cultural diversity of global choral features through collaboration with IFCM. Founded in 1992, China International Choral Festival is the only state-level International Choral Festival in China. Ten festivals have been held in two decades. China International Choral Festival believs that its mission is to further advance the great development and prosperity of choral music in the new era, and to promote cultural exchange. Choral music in the west has almost a thousand years of history, while in Asia, Africa and other countries people have also developed their own colourful choral art forms. To invite excellent foreign choral groups and choral music and to send the best Chinese choral groups and choral music is an important initiative of the China International Choral Festival. In 2012, the 11th International Choral Festival will invite IFCM’s five world-class choirs from five continents, bringing a dazzling display with different styles. Musicians from all over the world who participate in the International Choral Festival will also enjoy the different cultural characteristics of the music workshops. The most famous choral music masters and leaders from five continents will come to Beijing, bring their best, and exchange their views. In sending choirs abroad, the China International Choral Festival has won international recognition. The winner of the 2012 China International Choral Festival will represent China at South Korea’s World Choir Conference in 2014. The organizing committee of the China International Choral Festival will also recommend Chinese conductors and choirs to participate in different activities held by the International Federation for Choral Music. The operation and management of the China International Choral Festival will be simultaneous with the rest of the world. According to reports, this is the first time that the China International Choral Festival has started planning two years in advance. “Starting two years in advance, we will have time to select carefully the best choral groups from around the world, to book the biggest names among choral conductors, to find the most appropriate sponsors and to negotiate. Plus, we will have plenty of time for marketing and promotion,” says Mr. Tian Yubin, President of the China Choral Association. He is very confident when talking about plans for the future, “To be simultaneous with the world does not mean to organize the festival several months before it begins, but should be in accordance with the rhythm of the world – and this is our common aspiration with the International Federation for Choral Music.” To start preparation and communication two years in advance allows Chinese choirs and foreign choirs enough time to make their artistic and travel planning. Within the framework of cooperation, the IFCM’s resources will also be significant for Chinese choral groups and professionals. The IFCM and its organizations will synchronize the promotion in eighty countries around the world for the 11th China International Choral Festival, and will select first-class choirs and choir masters. International Choral Bulletin is the most authoritative international choral magazine. The IFCM will also grant a license to the organizing committee of China International Choral Festival to publish its Chinese digital version, which is expected to bring up-to-date international information to China, to inspire domestic choral professionals. Choirs from around the world compete in the “arena”, while the IFCM World Choral Summit is another stage. The Summit is where international choral community leaders gather, to set the rules for the choral world, and to outline the blueprint for future development. For the first time in its history, the Summit comes to Beijing in 2012. Thirty choral leaders from around the world will discuss the development of choral music, exchange different views, and share their culture and views. The choirs from five continents will present this great variety of cultures with their music. 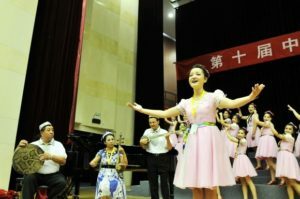 The China International Choral Festival resembles the “Olympic Games” and the “Expo”: Choirs from different nations compete at the highest artistic level just like athletes at the Olympic Games, while the exquisite display of various countries and their cultures illustrated by the choirs just makes the Choral Festival and the Summit a choral “Expo”.